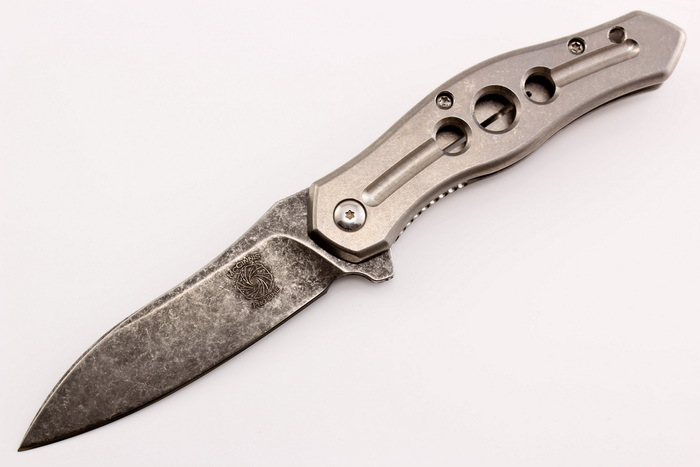 This mid-tech Pro Line Mini Exos features a 3.312-inch stonewashed flat ground drop point blade with flipper and thumbramp, with stonewashed natural titanium handles and solid lock-up with the integral framelock. It has a right hand tip up Titanium pocket clip. From Gerry's blog: McGinnis Pro Line is what we are calling it. I don't want to call it a Mid-Tech, because really the only thing being done outside of our shop is the blade grinding. So, we are going with the McGinnis Pro Line moniker to differentiate these knives from the purely custom side of things. They are all machined using the same processes as my customs, assembled by me the same way with the same attention to detail as I put into my customs, and I have 100% control over how these knives come out because we are doing 95% of it right here in the shop. My dad, 51 years old, is learning and excelling at all the tasks needed to make these knives a reality, and is my partner in McGinnis Pro Line. Two dudes, making knives and having fun! My knifemaking career started in 2004 as a Sophomore in High School. Mainly out of curiosity and the want for my own personal hunting knife that I had created on my own. I started slow, with files and sandpaper, heat treating with a torch, and just making fixed blades. Eventually I got real tools and a grinder and learned how to use it, and Alan Folts taught me how to make my first linerlock. Soon after I got into folders, I took a liking to flippers and began to teach myself how to make them. I got to the point where they worked well, but weren’t as fast as the top maker’s flippers . In 2006 I met Lee Williams and Matt Cucchiara. They taught me how to do internal stops and perfect the detents of my knives. Since then it’s been smooth sailing. Today, the majority of my knives are flippers, and I prefer them over all other types of folders for their ease of opening and functionality. I am constantly exploring new mechanisms, construction, and methods of manufacture.